This past Spring, our parish commissioned and convened a building committee that consists of parish and school representation in order to guide us through the forthcoming campus alterations resulting from the Beacon of Hope planning process. You’ll recall that parishioners had a chance to view two conceptual designs presented before Masses: The Park Solution and the Infill Solution. As of this writing, we have received a tremendous amount of feedback from parishioners regarding these two concepts. 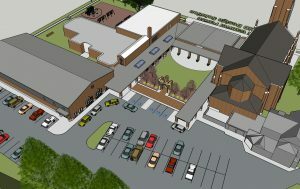 Based on that feedback, and discussions among building committee members, we have commissioned a third conceptual design – one that incorporates the parish’s desire to welcome, create intentional spaces for ministries like bereavement and youth, safety, minimize effects on parking, balance between beauty and practicality, etc. The building committee and I believe that we now have a solid conceptual design that will launch us into the next phases. A simple 2D rendering of the design is provided in this report for the sake of giving you a general idea. We are calling this The Hybrid solution. The committee has submitted further tweaks and changes to Chameleon Architecture, so keep in mind there will still be more developments to come before Chameleon Architecture does its 3D conceptual design. When that becomes available, all will be informed. Finally, as of this writing, members of our Beacon of Hope building committee, the parish’s Finance Council, and others have unanimously hired a firm to lead our upcoming feasibility study and potentially the capital campaign that would follow. After interviewing two firms that both came highly recommended, we have selected Walsh & Associates. They led our previous feasibility study for the Renewing the Heart of St. Gabriel campaign. Our timeline for our upcoming process ambitious, but with the Lord’s blessing, we believe that it can be accomplished. We hope to have the results of our feasibility study by November 15, which will inform us primarily of the level of support that exists in the parish as well as what our budget would be for the first phase of the building project. Based on that study, Walsh & Associates would then proceed thru the capital campaign process, which we hope to begin late winter/early Spring. If you have any questions or wish to give some feedback, please see any of our committee members or Fr. Dustin. They would be happy to speak with you. As far as our Capital Campaign committee goes, its membership is not yet full. When it is, Fr. Dustin will inform the parish. Below are links to watch the video of the Hybrid Solution and to look at the PDF versions of the Hybrid Solution.